The unusually attractive and easily readable Model CK-1000 is designed for a variety of commercial, industrial, home, and office type environments. Its easy to read LED display is viewable up to about 75 feet. It is widely in use in business offices, industrial plants, hospitals, police and fire departments, science labs, military installations, churches, gyms, government facilities, and more! The dependable CK-1000 digital clock carries a FIVE year warranty. 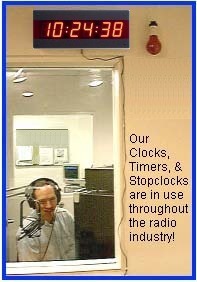 Displays Hours - Minutes - and Seconds! 12 or 24 Hour Clock Format - switch selectable. It can function as a 24 hour 6 digit clock for military Zulu time. 9 Volt AC U.L. Listed plug-in adapter - this is the familiar black cube that plugs into an AC outlet. LED display size: 2.3 inches. The display is bright red, and is readable up to about 75 feet. Unusually attractive and eye catching! High and low display brightness switch - the CK-1000 is comfortable and easy to read under various lighting conditions. Battery backup keeps time during power outages. Never miss a second! The display turns off to conserve power, but the clock keeps time. Also, no odd batteries to replace unlike competitor models. Uses a standard, easy to replace 9 Volt battery. WE KEEP IT SIMPLE! Easy to access time set switches on back of the case - buttons for setting Hours, Minutes, and Seconds Hold. No flashing LED colons! They are annoying. Unlike other clocks on the market, the CK-1000's LED display colons do not flash. It's always pleasant to look at. Durable white plastic case with a clear red acrylic and black ABS plastic front panel. The CK-1000 looks sharp, and blends in nicely with a white wall in an office or commercial environment. Size: 15.0 x 6.0 x 2.0 inches - a nice size and not overwhelmingly large. It will not dominate a room. Weight: Only 2.0 lbs. Easy to hang on a wall, and very straight forward and simple to install. Energy Efficient Design: uses only about 1 WATT of power. Saves money over time! Easy to use. No menus to fuss with and very easy to set. In production since 2000, the CK-1000 is reliable, USA assembled, and backed by our excellent service and pride. Our warranty says it all - Time Keeping Excellence. We Proudly Stand By Our Products! Your satisfaction is fully guaranteed. We feel the CK-1000 is a great value and high quality product. Our warranty says it all - it is DEPENDABLE and USA Assembled! It works well in any application where a sizeable easy to read display is required. It's in use throughout local, state, and U.S. government facilities, U.S. defense agencies, broadcasting, and countless business & commercial locations! Installation Note: One unique feature is that it has a versatile choice of Two Power Input Jacks: One on the rear panel, and one at the bottom of the case. It is suitable for wall, shelf, or table locations. There are rubber feet on the bottom of it's enclosure, and a very sturdy hanging bracket is located on the back side. Installation is simple and easy! 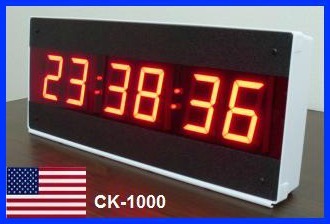 The CK-1000 LED digital wall clock has been in production since 2000. RELIABLE SIMPLE EASY TO USE LOOKS GREAT! CK-1 Digital Desk Clock : 0.56 Inch LED display. 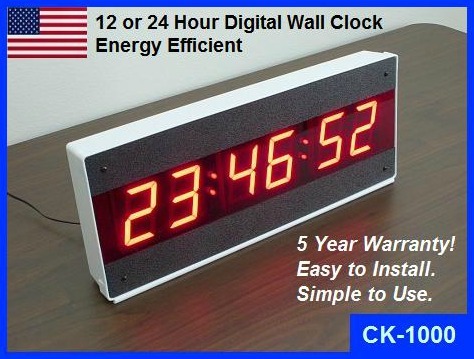 CK-1000 Digital Wall Clock : Large 2.3 Inch LED display. CK-2 Dual Time Zone Clock : 0.56 Inch dual LED display, six digits. CK-2000 Time Zone Wall Clock : Displays GMT Zulu and local time in a compact wall mounted display. CK-3 Digital Count Up and Countdown Desk Timer : 0.56 Inch LED Display, Six Digits. CK-3000 Large Digital Count Up and Countdown Timer : 2.3 Inch LED Display, Six Digits. CK-4000 Large Display Digital Stopwatch Timer : 2.3 Inch Display: Minutes, Seconds, & Hundredths of Seconds. 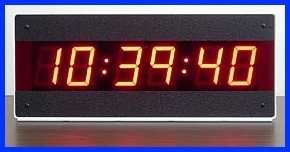 CK-5000 Event Countdown Wall Clock : 1.75 inch Display shows DAYS, Hours, Minutes, & Seconds. CK-6 Day Countdown Timer : 0.56 inch Display shows DAYS, Hours, & Minutes. Also counts up. CK-36 Count Up Timer : Small desk version of the CK-350.